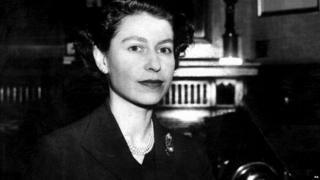 Princess Elizabeth became Queen in 1952 when her father died of cancer. In this photo she is making her first Christmas Day broadcast to the Commonwealth. 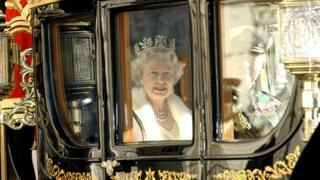 This year is The Queen's Diamond Jubilee, and a weekend of celebrations are planned. 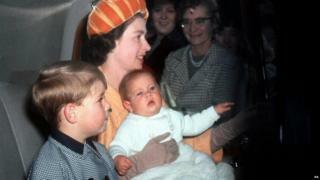 The Queen had two more children - Prince Andrew was born in 1960 and Prince Edward, the baby in this photo, in 1964. 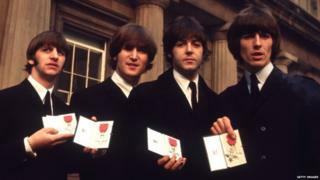 In 1965 the Queen awarded pop group The Beatles with MBE awards. The Fab Four from Liverpool had millions of screaming, adoring teenage girl fans. Recognise the guy middle-right? 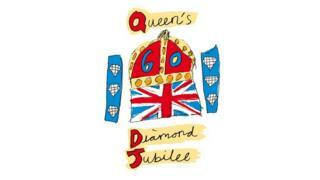 Fast forward to 2012 - Paul McCartney was the headline act at the Diamond Jubilee Concert. 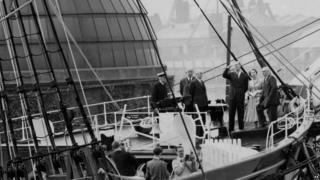 In June 1957, The Queen opened the Cutty Sark in London. The former tea clipper was put on display for the public to visit. Here's The Queen preparing for her Christmas broadcast in 1967. The colour photo really shows off all the gold! 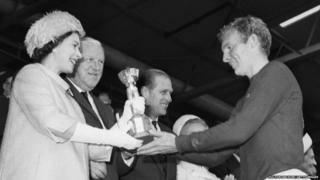 When England won the footy World Cup in 1966, Her Majesty was there to hand the trophy to England captain Bobby Moore. 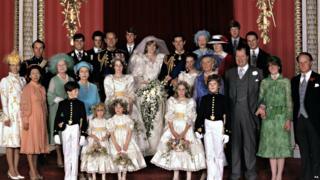 In July 1981, Prince Charles married Lady Diana Spencer. They went on to have two children together - Prince William and Prince Harry. Can you spot The Queen in this wedding photo? 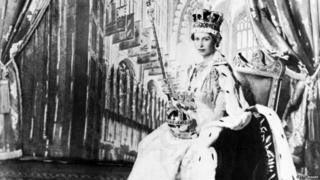 She was crowned at Westminster Abbey on 2 June 1953 when she was 25. Here she is holding the royal sceptre. In the year 2000, the Queen Mother turned 100 years old! Thousands of people flocked to the streets outside Buckingham Palace to cheer the longest living royal in the history of the British monarchy. 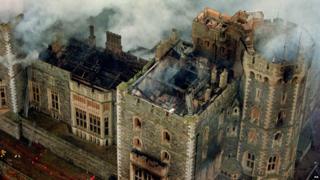 Disaster struck in 1992 when Windsor Castle caught fire. It's believed a spotlight set a curtain on fire. It took 250 firefighters 15 hours to put the blaze out. The following year, the Queen opened Buckingham Palace to visitors for the first time, to raise money for repairs. 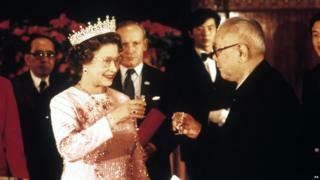 In 1986, Queen Elizabeth II attended a banquet in Beijing with President Li Xiannian. She was the first British monarch ever to visit mainland China. 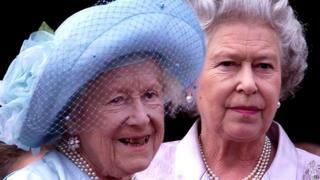 The Queen Mother died in 2002 aged 102, and The Queen's sister Princess Margaret also passed away. 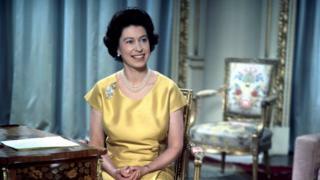 These sad events happened in the year of the Queen's Golden Jubilee - 50 years on the throne. 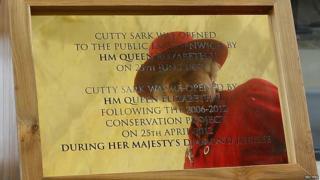 She visited the Cutty Sark again in April 2012 to re-open the attraction. It had been destroyed in a fire but restored by conservationists for the public to enjoy again. 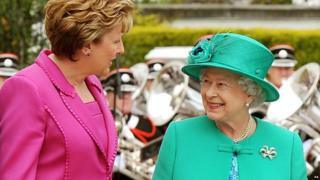 Here's The Queen visiting Ireland last year. She's talking to the then Irish President Mary McAleese. It was the first visit to Ireland by a British Royal in 100 years. 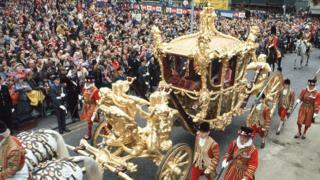 Crowds came to see The Queen in her golden carriage in 1977 as she attended a ceremony to mark her Silver Jubilee - that's 25 years on the throne.